Brining is a method of salt-based food preservation and a method of seasoning foods. A basic brine features salt and water in specific amounts. Although meats can be brined prior to cooking, vegetables -- including potatoes -- can also be brined to preserve them in a jar or can or to season them prior to a meal. In either case, brine potatoes with ease at home. This gives your potatoes a distinct salty flavor that pairs well with your other menu items. 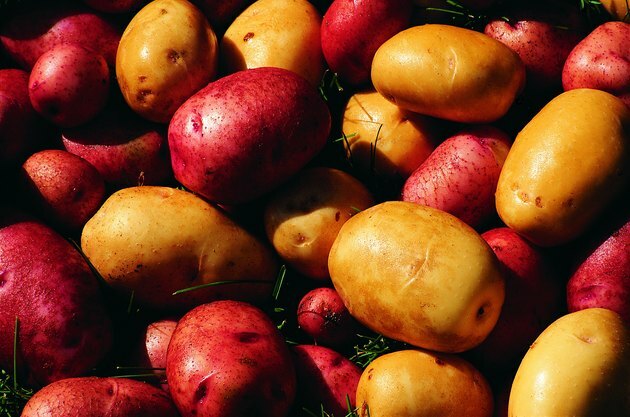 Wash the potatoes under cold water to rinse off dirt, chemicals and other sediments on the surface of the vegetables. Fill a large mixing bowl with 8 cups of water for every six russet potatoes you plan to brine. Dissolve 1 cup of kosher salt in the water. You may need to stir the water to facilitate the dispersal of salt throughout the water. Place the whole potatoes underneath the saltwater brine and leave them submerged for 2 to 8 hours, depending on how strong a salt-brine flavor you would like them to feature. Once the brining has been completed, remove the potatoes and continue cooking as desired.